This is a small 38mm x 42mm (1.49606-inches x 1.65354-inches) board. It runs off 5-volts of power, and it features a built-in 3-watt amplifier with a potentiometer that handles volume control. 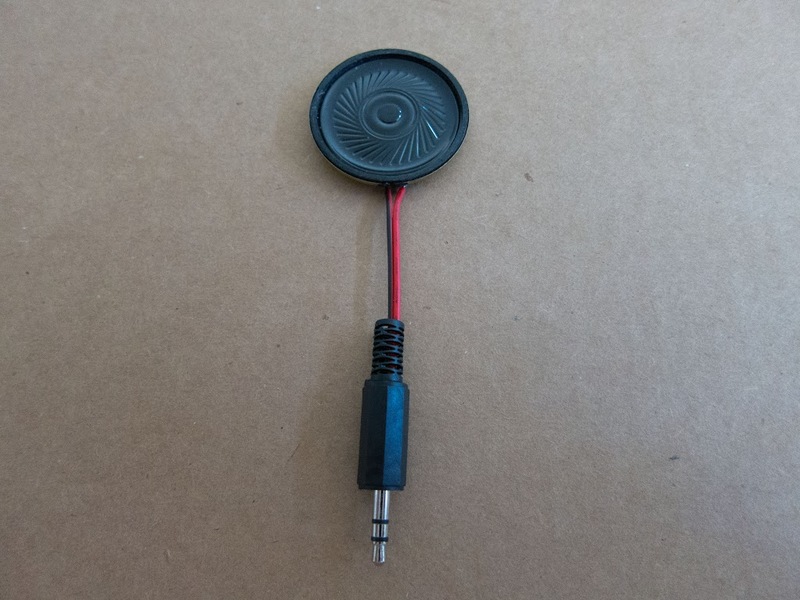 It has a standard 3.5mm audio-out jack, and will work with speakers up to 2-watts with a 4- to 8-ohm load. It will take FAT16- / FAT32-formatted microSD cards up to 16GB in size. The board takes both MP3 and WAV files. Sample rates of 8, 11.025, 12, 16, 22.05, 24, 32, 44.1, and 48-kHz are supported. 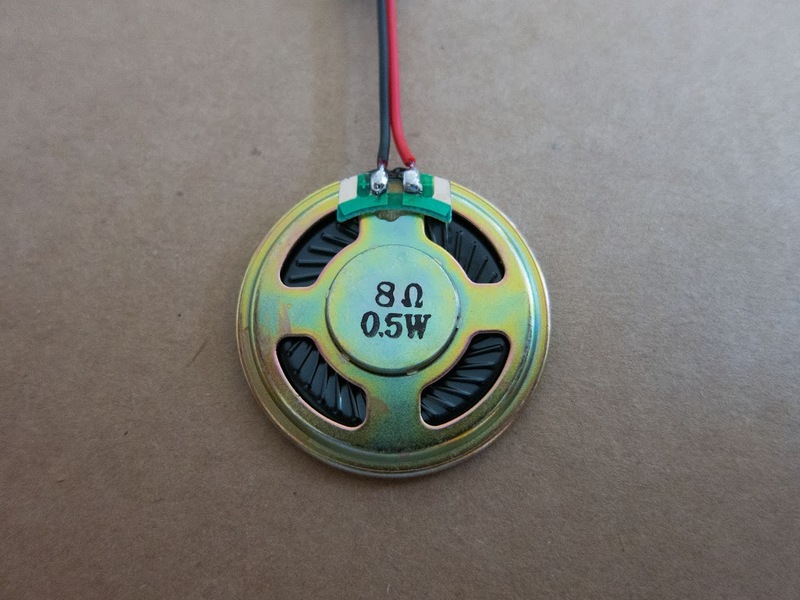 The package includes a decent-sounding 57mm diameter (2.24409-inches) 0.5-watt 8-ohm speaker with 3.5mm male connector and four connector cables. Each of the nine ascending trigger ports correspond to sound files in the order they were saved onto the microSD card. So trigger "1" would play the first file saved to the microSD card, "2" would play the second file saved to the card, and so on. Please note that I only had one momentary switch available to me, so in the video you will see me change trigger port connections before each file is played. Towards the end of the video, you will also see me attach an LED (with soldered resistor) to the board to demonstrate the "poor-man's" way of adding simplistic lighting effects to match the higher-frequencies of whatever sound files are played. This effect can be used for something like a starship phaser beam or torpedo launch. 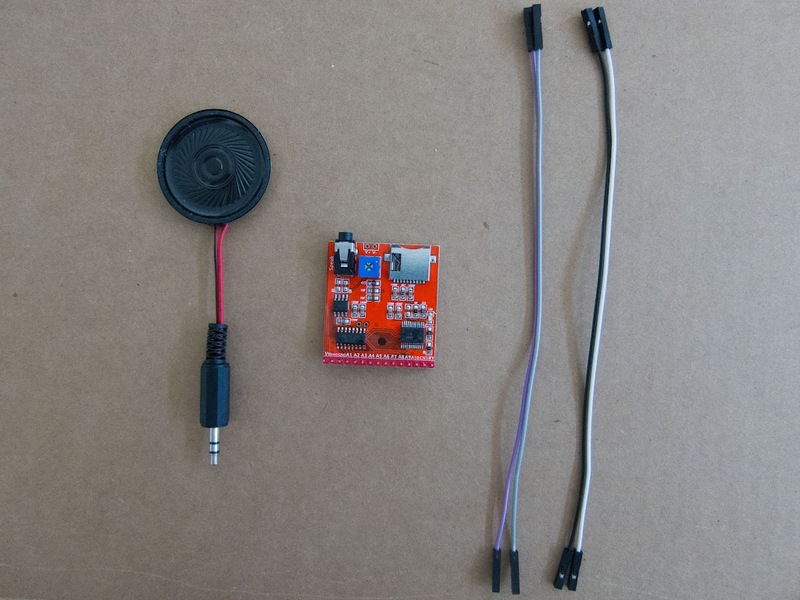 For less than $10 U.S.D., this board is definitely a very good alternative to some of the other sound solutions out there that we modelers have been using. I'm very happy with this find! Thanks for sharing! I am going to give this a try for my Millennium Falcon build. 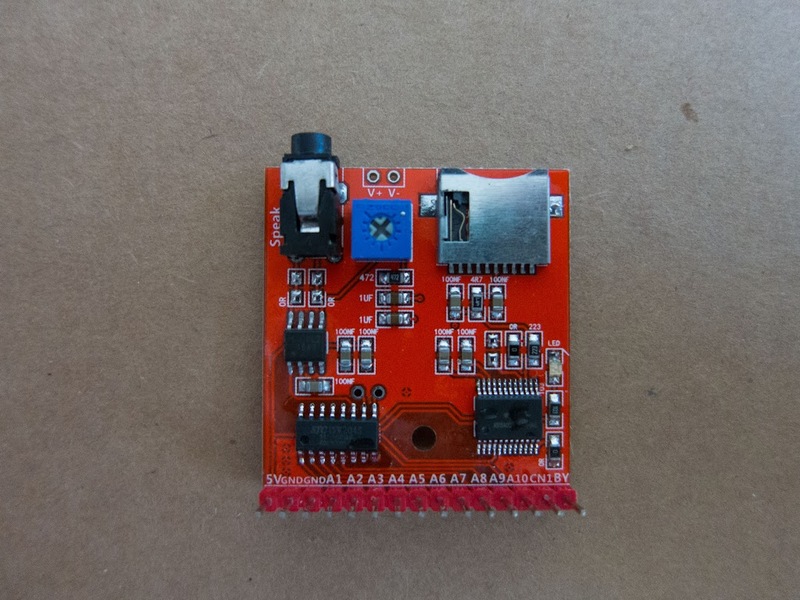 If you are planning on trying this board for your model build(s) and your planned internal electronics is running at 9- or 12-volts, you will need a step-down power module to go between the incoming power connection and the sound board. The sound board runs on 5-volts 1A, so if you forget to add a step-down board, dropping it directly into a 9- or 12-volt setup will fry it. That sounds interesting (no pun intended). Thanks for sharing! BUT, mine just "hums", no LED blink, nothing. 5V in, polarity correct, 5 files on SDCard, all WAV files, 16k. I tested the step down board with a multimeter and it does output 5-volts (5.06 volts to be exact). With my test, a 12-volt power supply was used as the input. The sound board needs 5-volts to work correctly. You can skip the step down module, of course, if you are providing 5-volts 1-amp directly to the sound board. You can use other speakers or powered speakers with the board. If the board is picking up power correctly, the red LED marked "LED" should immediately come on. The blue potentiometer is a output level / volume control. Small-capacity microSD cards should work fine in the reader slot. I used an inexpensive 2GB card. Name your nine MP3 files as follows: 01.mp3, 02.mp3, 03.mp3, etc. and save each to the microSD card in the order in which each is named. John Petre also bought the sound board and made a YouTube video demo. Here's the link: https://youtu.be/cKN5regPfNQ. In his video, he shows how to use just one momentary switch to jump from one track to the next by using the second "GND" pin and the "CN1" pin. Everything is pretty straightforward. Let me know if you have any other questions. I hope it helps. Yeah...I'm not getting an LED light with a dedicated 5v2A PSU. Does the LED come on with just power, no SDCard? I'll try the naming system, see if that helps. OK...I feel like an idiot now. 40+ years ago, I learned the "Laws of Basic Electronics". #1: If it don't work, PLUG IT IN. If it's DC, flip the polarities. Well, all is working good now. Thank you SO much for the "details". I was a bit confused on what the CN1 pin was. The board works fairly well for a cheap, trigger WAV/MP3 player. The incredibly long ship times, with no local source is a turn off for me, but, it works, as does the job I need it too at a good price. A1-9 are the 9 triggers, Vcc,GND, and trigger ground are easy enough to decipher, CN1 "steps" the 'playlist", and BY is a signal high/low telling a controller or another circuit that the board is 'busy'. So, what is pin A10 for? Anybody try it?